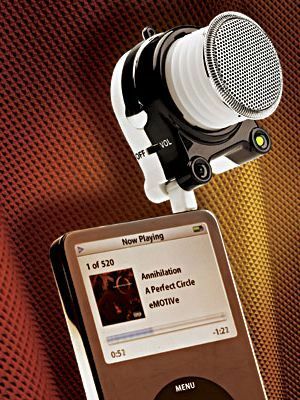 Turn your iPod or MP3 player into the life of the party with extreme sound from a device you can fit in your pocket. Boost your bass and fill your room with deep, rich sound. No one will suspect that you hold the power to fill an entire room with sound in your pocket. When you pull the podXtreme out for the first time, people might even chuckle. But when they stumble back from the powerful sound this mighty speaker projects, you might just find yourself smiling at their amazement. No other speaker on the market packs such a punch in such a small unit. It should be illegal, so much power in such a small space. The podXtreme draws its power from a built-in rechargeable lithium ion battery that is recharged via your USB port (or you can plug it into the the wall). Drawing upon its own power source, the podXtreme allows you to listen to music with much more volume and for a longer period of time than a speaker that pulls power from your MP3 or iPod. The secret resonator provides the podXtreme with such a powerful bass boost that you're going to need to pimp out your iPod or MP3 player with spinners. Operating the same way as a quality subwoofer, the secret resonator helps to elongate your sound through the expanded tunnel, creating a deeper bass and richer sound. Who knew that such rich sound could be produced from such a tiny device? The podXtreme is your gateway to rich, powerful, party causing sound. Start making plans now because as soon as you order the podXtreme, the party is getting started. Nothing like a bit of understatement to quietly amplify, what?